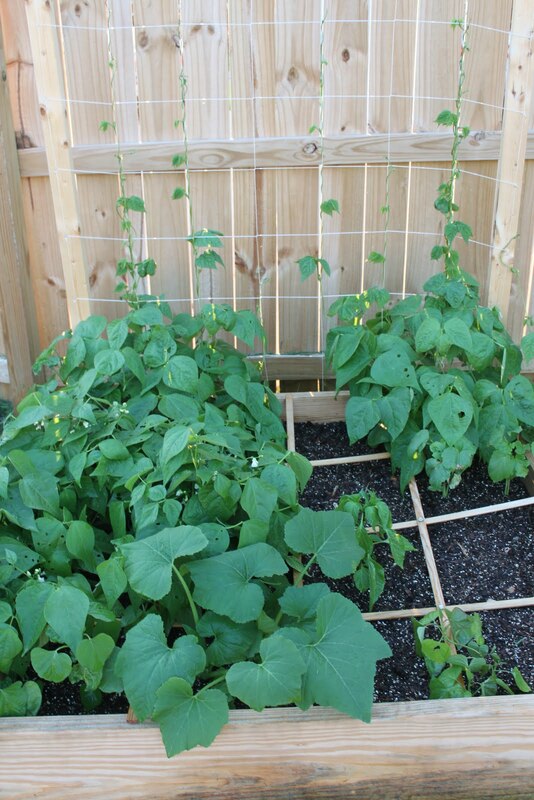 There's been a mass amount of growth in my garden over the past month. 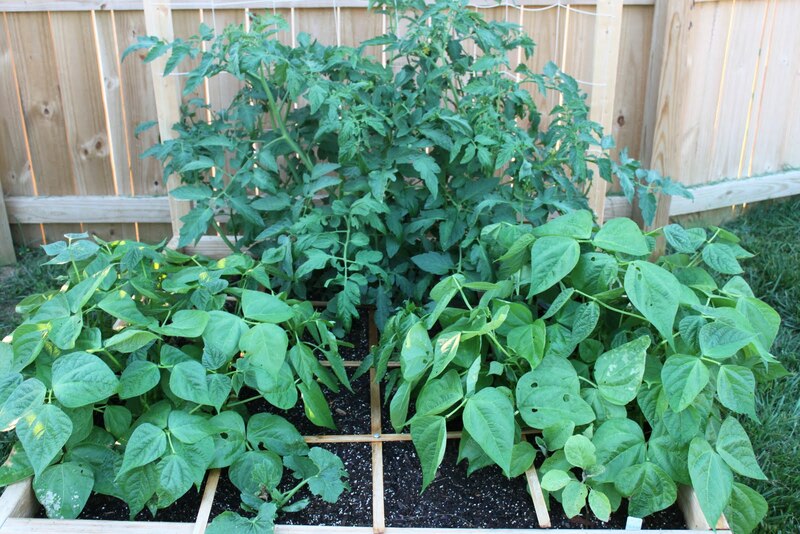 Some of the plants have come from seed and some were purchased plants that have taken off a little faster. 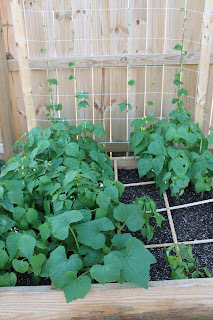 Our trellises are up which are helping to support our growing tomato plants and the beans have started climbing...seriously on their own! I'm afraid our 6 foot support won't be tall enough. I've been using the fresh herbs pretty regularly, but we have our first sign of real vegetables (or fruit I should say). 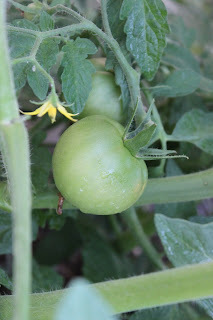 We have three green tomatoes with lots of flowers promising more to come. 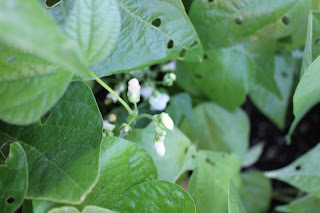 We also have flowering bush beans which I'm assuming will bring bean pods soon enough. Unfortunately I have some sort of bug problem I haven't been able to figure out just yet. See all those lovely little holes...no bug in sight. I think my biggest problem is going to be overcrowding. 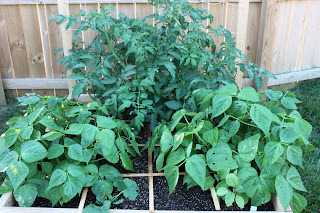 I went all out and planted to the max in each square (some are still open for later plantings) but I wanted to use my small gardens to their full potential. 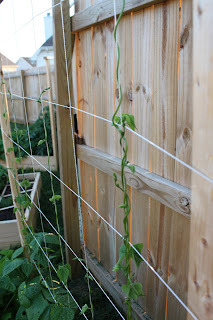 As you can see the tomato plants and bean plants are overtaking everything. 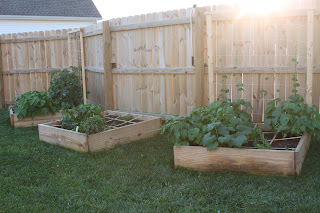 You can't even see the okra, cucumbers, sweet peppers, and squashes that have been planted. I'm sure many lessons will be learned this season...I'm just along for the ride.